Home/Science of Sound/Sound/How are sounds made? Sound is created by a vibrating object. For example, when a drum is struck, the flexible skin (sometimes called a membrane) of the drum vibrates. The compression and expansion of the air on either side of the vibrating membrane produces differences in air pressure. The pressure differences generate a sound wave that propagates outward from the drum surface. Video of a drum being played with animated sound waves. The particles on the drum are there to help see the vibration of the drum membrane. Video Credit: DOSITS. The frequency produced by a vibrating sound source is related to its size. For example, a large bass drum generates lower-frequency sounds than smaller drums. 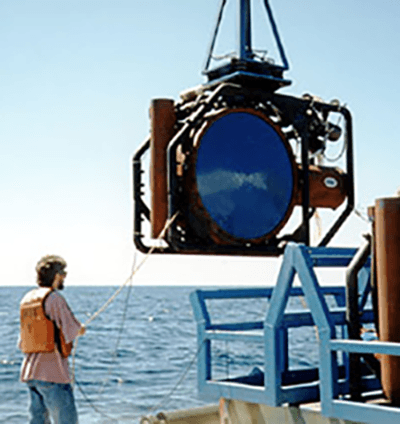 The large, round, drum-shaped object about to be lowered into the ocean in the picture to the right is a low-frequency sound source. There is a second, drum-like surface on the side facing away from the camera. Pistons located inside the source push on the centers of the drum-like surfaces. Sound is generated by the in-and-out motion of the surfaces at the frequency at which the pistons push in-and-out.